"The horse spirit is no different from a human spirit. You can probably hear their cries; you can probably hear hoof beats; you can probably hear a gunshot. And that spirit of the horse is probably still in these canyons." Mustangs represent the spirit of the Old West. Wild and free, they invoke images of vast rolling prairies, untamed hills and mountains, hidden canyons. WILD HORSES: An American Romance looks at rise and fall of the mustang in the Western United States. The program is a co-production of Nebraska Educational Television and South Dakota Public Television.Though the ancestors of horses once roamed across North America, they died out thousands of years ago. The horse returned to the Americas with the invasion of the Spanish explorers in the 16th century. Some of those animals escaped from or were freed by their masters, reproduced in the wild and became the foundation for the herds of mustangs that still roam the American West today. Over the centuries, more horses have joined these wild bands.One of the enduring romances of the Old West is the tale of the spiritual bond between mythic heroes and the wild horses they tamed. 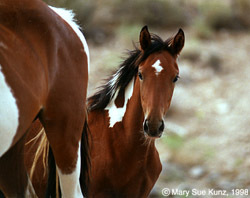 At the turn of the century, there may have been as many as 2 millon wild horses. But the Old West is no more. Roads, cities, ranches, farms, people and progress have covered much of the mustangs range, and the remaining horses are scattered throughout publicly owned lands and on a few private preserves in the West. The transition has been cruel and bloody. Earlier in this century, wild horses were hunted down and shipped to slaughterhouses. With the governments blessing, mustangers used means fair and foul to destroy these icons of the past.In the 1950s, the tide began to turn. As people became more attuned to humane animal treatment, the cruelty and the waste of the mustangers gave birth to a movement to protect these wild and free creatures. On Dec. 15, 1971, Congress passed the Wild Free-Roaming Horse and Burro Act. Today, an estimated 39,000 mustangs still roam federally managed lands in the West. The Department of Interiors Bureau of Land Management keeps mustangs from overwhelming the rangeland by capturing thousands of the horses each year and making them available for adoption by citizens. Since 1973, more than 140,000 wild horses and burros have been adopted throughout the United States.